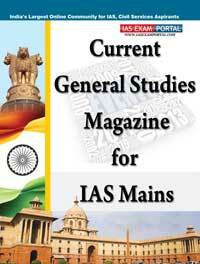 Current Affairs General Studies Magazine for UPSC MAINS | IAS EXAM PORTAL - India's Largest Community for UPSC Exam Aspirants. We are happy to announce that we have started a Current General Studies Magazine, a very INDISPENSABLE MATERIAL FOR GENERAL STUDIES. This is a Part of General Studies Online Coaching .